If your tap water looked like this, would you drink it? No? Then you may be surprised to hear that water like this exists in many places across Australia. The reason the water looks so unhealthy is because it has been affected by acid mine drainage, also known as AMD. According to recent reports there could be up to 60,000 abandoned mines across Australia, so environmental pollution caused by AMD is an issue that seriously needs to be addressed. However, in March this year, Michael Sephton and Dr John Webb from La Trobe University published a paper in Applied Geochemistry where they proposed a novel solution to combat AMD: using cement to cover up mine wastes. There’s a mineral called pyrite (FeS2) that’s commonly found in mine waste. Pyrite reacts with water and oxygen to form sulfuric acid, and this is the key process that creates AMD. This reaction also releases iron into the water; the iron can then form iron oxyhydroxide minerals, which stain the water blood red. 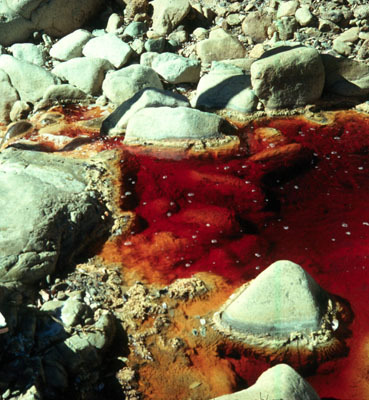 Acidic water can also leach metals and metalloids such as lead, copper and arsenic out of mine wastes. Therefore, a river affected by AMD becomes corrosive and poisonous, and this can have serious effects on the health of anyone who tries to use it. Mr Sephton and Dr Webb collected waste rocks from the Brukunga pyrite mine in South Australia and used them to set up 12 column experiments. They used three columns as controls, and applied cement mixes with differing water/cement ratios to the other nine columns. Then, they poured water into the columns and measured the acidity and metal concentrations of the water that ran out the bottom of the columns. They repeated this process 21 times over the course of one year. The results were stunning: two of the cement mixes were able to completely neutralise the acidity of the water, and metal concentrations were usually below the detection limit. The other cement mix reduced the acidity of the water by 85% compared to the control columns. Not only did the cement neutralise the acidity produced by the mine waste, it also covered the surfaces of the rocks and filled the gaps between them. This made it harder for water and oxygen to come into contact with pyrite, reducing the amount of acidity the waste produced. Mr Sephton and Dr Webb calculated that the cement would continue to neutralise AMD for at least a decade. So not only is cement highly effective at counteracting AMD, it would require less monitoring than many current AMD management systems. As a result, this innovation could make it much easier to protect our precious environment from the consequences of mining in the future. If you want to let the Australian Department of Environment and Energy know that protecting our waterways is important to you, please contact them here.